My family loves chicken almost any way I fix it. I am especially fond of chicken seasoned with curry and I like the convenience of casseroles, as this allows me to cook everything in one dish. I just started putting things together the other night and this is what came together for our dinner. Hubby and our son Matthew really enjoyed this and declared it a “keeper”! 1. Cook the noodles according to the package directions; drain. Pour into bottom of a 13×9-inch casserole. 2. In a small skillet, sauté onion in butter until tender; stir into noodles in casserole. 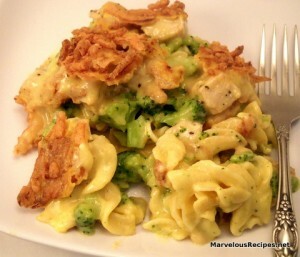 Layer the broccoli, cubed cheese, cooked chicken and 1/2 the French fried onions over the noodle mixture. 3. In a large bowl, combine the soup, milk and curry powder; pour over the noodle mixture. Sprinkle remaining French fried onions over the top. 4. Bake at 350 degrees F. for 20 to 25 minutes or until hot and bubbly and onions are golden brown. Makes 8 servings. Another great sounding recipe!!! Thanks for sharing!! I rejoice at your news of your husband returning to work today! I know he was so happy!! I am so happy for you guys!! God bless you!!! Have a great week!! !